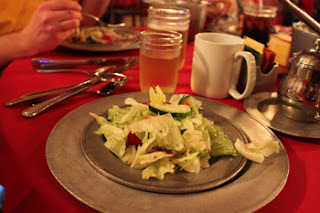 We LOVED the Hoop Dee Doo Musical Review at Fort Wilderness. The chef gave us most of the same food options as everyone else. They had corn bread, and we did not (they did have gluten free corn bread, but not dairy free). They gave us salad, beans, ribs and baked potato. They offered to make us grilled chicken, but we passed. There was plenty of food. I was disappointed with the dessert, once again. It was raspberry sorbet. 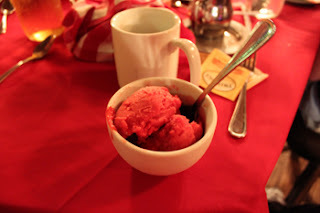 I don’t really like raspberry sorbet, in the first place, but it was this, or fruit. Yay! They could add some chocolate and fresh berries and make it LOOK pleasant. Oh well. I was not impressed with the food flavors, but it was a great dinner show. We enjoyed it immensely. I just thought the beans and ribs were so so. Every other place I’ve had ribs have had a better sauce, but it was fine. I recommend going to see the show!